Its almost confirmed now that Egyptian President Hosni Mubarak will have to leave the Presidency today or tomorrow in result of massive protests by Egyptian people who are looking for a change. 300 people have lost their lives until Monday in these Protests. Now a big question that is coming in minds that who will rule the Egypt in the future? 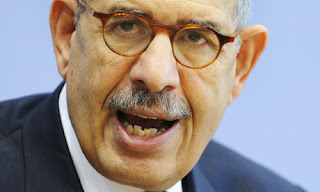 Some are saying Muslim brotherhood while some thinks opposition leader Mohamed Elbaradei. Mohamed Elbaradei is Director General of the International Atomic Energy Agency another puppet of America just like Hosni Mubarak. America supporter dictatorship of Hosni Mubarak for 30 years and now as people of Egypt are tying to bring a change US wants to hijack this revolution by another puppet Elbaradei. What US and Israel don't want to see is a Independent Government. US and Israel are also not ready to accept Muslim brotherhood in Government even if it comes by winning the elections. Only time will decide that who will rule the Egypt in the future?